In this tutorial, we will install Mailpile, a fast, secure, and beautiful webmail client, on Ubuntu 14.04. A webmail client like Mailpile is a great way to ensure you can access your email from anywhere without the hassle of configuring a standard email client. Mailpile is just a mail client, meaning it only manages existing mail accounts. By the end of this tutorial, you will have a fully-functional Droplet running Mailpile with Nginx as a reverse proxy. It also lacks an easy way to run as a service. By default, it only runs as an interactive script in your SSH session. We've included an Upstart script that uses Screen to run it in the background, so you can leave the webmail client up as long as you'd like. This is not recommended for production, however. That's it! If you have everything all ready to go, proceed to the first step. In this section we will prepare our working environment for the Mailpile installation. First we need to log into our Droplet. If you haven't used SSH before, see this tutorial on SSH. Make sure you're logging into a user with sudo access. First we need to install Git. We will use Git to clone the Mailpile source from GitHub. We need the sudo command to allow Git to create a directory inside of /var, which is a system directory. We're almost ready to get Mailpile running. Proceed to Step 2 to begin tackling some more requirements. In this section we'll get Mailpile's requirements installed and configured. pip will allow us to install Mailpile's requirements more easily. You'll see how in a minute, but first we need to install a few more things. We're now ready to harness pip's abilities to install the rest of our requirements. You're done. All requirements have been installed and Mailpile is ready to use. But before we do, we need to take a few extra steps to tighten our security. In this section we'll configure Nginx as a reverse proxy for Mailpile. This will make Mailpile more secure, allow us to use an SSL certificate, and make it easier to access the webmail client. With Nginx, instead of accessing Mailpile by visiting https://example.com:33411, you can use https://mailpile.example.com. Let's get started! Now that Nginx is installed, we can set up the reverse proxy. Let's edit Nginx's configuration to tell it to route our subdomain to Mailpile. If you've just installed Nginx, the command should return nothing. Note: make sure your certificate and key are located at /etc/nginx/ssl/nginx.crt and /etc/nginx/ssl/nginx.key. Otherwise, update the paths next to ssl_certificate and ssl_certificate_key to match your certificate and key locations. What we just entered told Nginx to listen on port 443 (the port websites with SSL access, as opposed to port 80), apply our SSL certificate, and turn SSL on. Now we need to actually serve something to this new HTTPS URL we've redirected to and enabled SSL on. We'll do that next. The default site should already be enabled. Please read this article about Nginx server blocks if you would like to learn more. That's it. 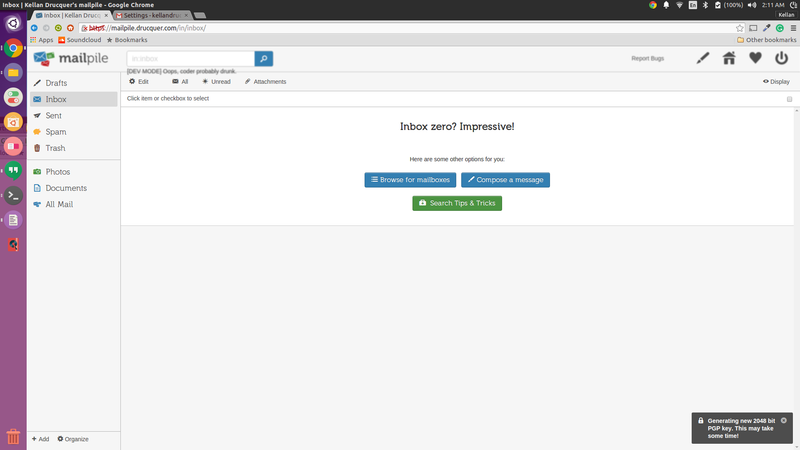 Now Mailpile is ready to be reached at https://mailpile.example.com. You may have to accept the SSL warning if you used a self-signed certificate. 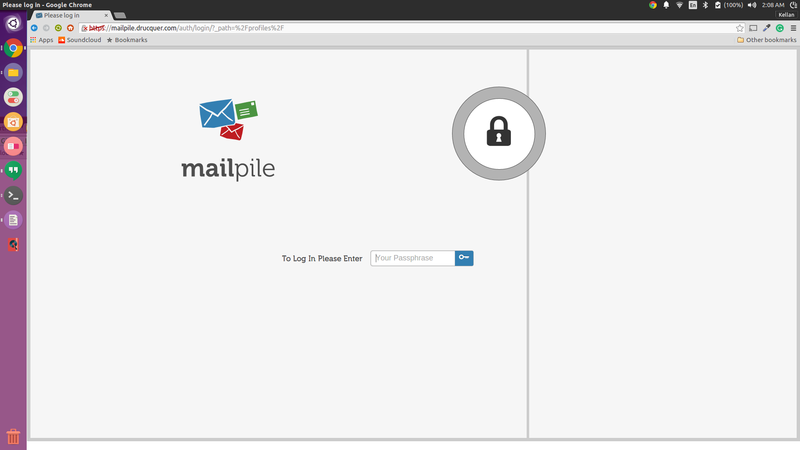 Also, accessing http://mailpile.example.com will automatically redirect to the SSL version of the site. We haven't run Mailpile yet, so if you visit those URLs now, you'll see a 502 Bad Gateway error. The most common reason for this error is that the Mailpile application is not running. Proceed to Step 4 to run Mailpile. 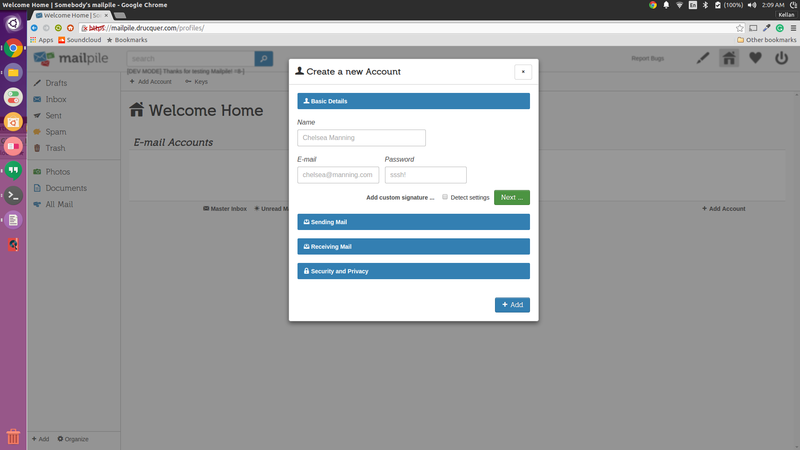 In this section we'll start Mailpile, and configure it to work with our reverse proxy. You can start exploring Mailpile through the command line or the web interface now. A word of warning: Mailpile will not save your settings after it stops. So, before you spend time configuring it, you may want to complete the optional next step of running it like a service. Mailpile should now be live at https://mailpile.example.com, and even redirect to HTTPS using your SSL certificate. Congratulations! You can use CTRL-C and then type quit to quit Mailpile. To ensure Mailpile is always active and ready to handle your mail, you can convert Mailpile to a service, using Upstart. Follow this wonderful tutorial for instructions. This script will start Mailpile and keep it up as long as the Screen session is running. It does not properly stop the Screen session, so you'll have to stop the Screen session manually if you want to stop Mailpile. This will result in a Screen session called 12345.mailpile_init owned by the root user. However, the other Upstart commands will not work. You will have to end the Screen session manually. Also, if the service crashes or is stopped, you'll have to start it again and reset all your preferences. This section covers basic Mailpile use from the webmail interface, at https://mailpile.example.com. 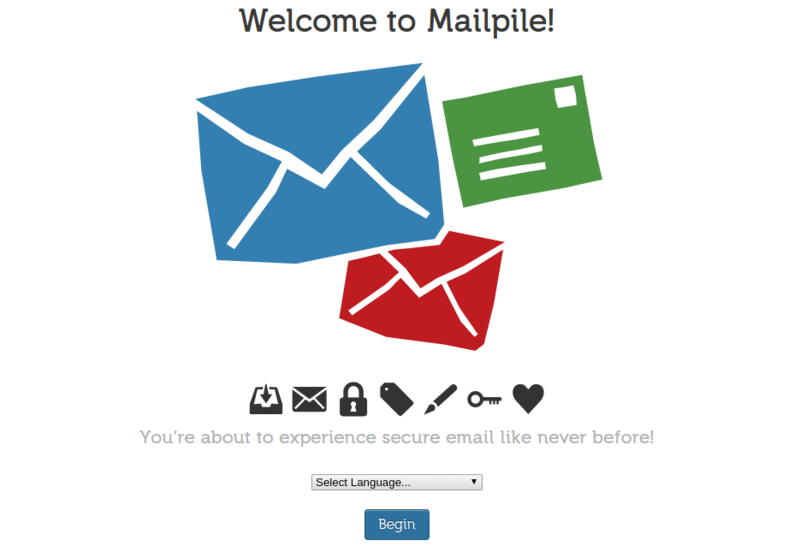 Here is the screen you’ll see when you visit Mailpile for the first time. Choose a language from the dropdown menu. Create a new password, then enter it twice. Click the Start using Mailpile button. The Login Screen: please enter the password you just created. Add a new account with the + Add Account button. 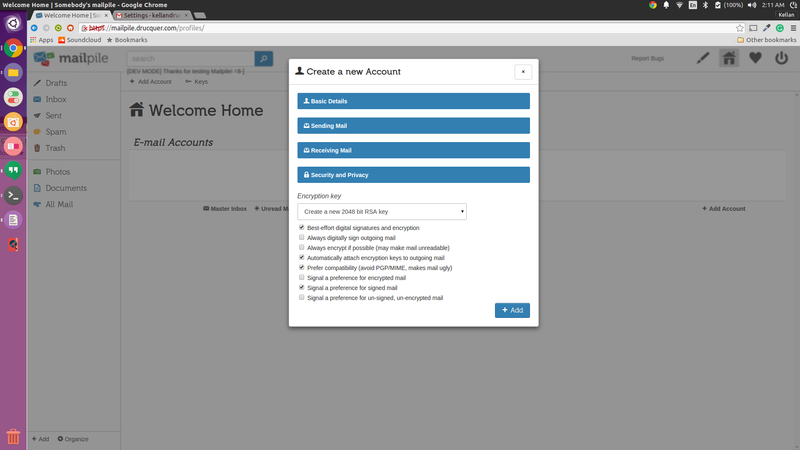 From here, you'll need to enter details for a mail account you own. You should enter the email address and password for that specific mail account. Mailpile will then attempt to connect to your account with those credentials, which can take a few minutes. You can also enter the Sending Mail and Receiving Mail credentials manually, if Mailpile can't figure them out itself. Gmail blocks Mailpile from using your Gmail account credentials, so you can't add a Gmail account to Mailpile — at least not easily. Try sending and receiving a test email for the account you added to Mailpile to a different email account. If this is successful, you'll know Mailpile is working with your email address. To get started with Mailpile, see the FAQ. For more configuration options, run help from the Mailpile command line. Congratulations, you now have your very own webmail client, Mailpile, running on a Ubuntu 14.04 Droplet. It is fully equipped with SSL and automatically redirects to the HTTPS version of your site. You may now set up your email accounts and manage your contacts, mail, categories, and more with Mailpile's beautiful interface. Have fun!